Celeste M. Torio, Ph.D., M.P.H., and Brian J. Moore, Ph.D. This Statistical Brief presents data from the Healthcare Cost and Utilization Project (HCUP) on costs of hospital inpatient stays in the United States in 2013. It describes the distribution of costs by expected primary payer and illustrates the conditions accounting for the largest percentage of each payer's hospital costs. The primary payers examined are Medicare, Medicaid, private insurance, and uninsured. The hospital costs represent the hospital's costs to produce the services—not the amount paid for services by payers—and they do not include the physician fees associated with the hospitalization. Figure 1 presents the distribution by expected primary payer for aggregate hospital costs and total hospital inpatient stays in 2013. In 2013, aggregate hospital costs for 35.6 million hospital stays totaled $381.4 billion. The five most expensive conditions—septicemia; osteoarthritis; liveborn (newborn) infants; complication of device, implant or graft; and acute myocardial infarction—accounted for approximately one-fifth of the total aggregate costs for hospitalizations. The top 20 conditions accounted for nearly half of aggregate hospital costs. The primary payer shares of aggregate hospital costs were 63 percent for Medicare and Medicaid, 28 percent for private insurance, and 5 percent for uninsured hospitalizations. Septicemia ranked among the four most costly conditions in the hospital for all four payer groups. Hospitalizations associated with pregnancy and childbirth accounted for 5 of the 20 most expensive conditions for hospital stays covered by Medicaid. Mood disorders was a top-ranked condition for stays covered by Medicaid and private insurance and for uninsured stays. Figure 1. Aggregate hospital costs and hospital stays by payer, 2013. 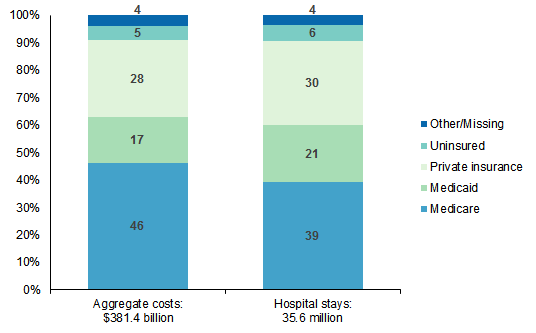 Figure 1 is a stacked bar chart that shows the percentage of aggregate hospital costs and hospital stays by payer in 2013. Aggregate costs for 2013 were $381.4 billion. Data show the percentage of aggregate hospital costs by payer: Medicare: 46%, Medicaid: 17%, Private insurance: 28%, Uninsured: 5%, Other/missing: 4%. Hospital stays totaled 35.6 million in 2013. Data show the percentage of hospital stays by payer: Medicare: 39%, Medicaid: 21%, Private insurance: 30%, Uninsured: 6%, Other/missing: 4%. In 2013, Medicare accounted for the largest proportion of aggregate hospital costs (46 percent). Patients with primary Medicare coverage accounted for 46 percent of the $381.4 billion in aggregate hospital costs in 2013. Private insurance was the second most common payer, accounting for 28 percent of total costs, followed by Medicaid with 17 percent of costs. Stays of uninsured patients represented 5 percent of total hospital costs. Government payers (Medicare and Medicaid) accounted for 63 percent of all hospital costs. Patients covered by Medicare accounted for a larger proportion of aggregate hospital costs (46 percent) than of hospital stays (39 percent). In contrast, patients covered by Medicaid accounted for only 17 percent of hospital costs but 21 percent of hospital stays. Table 1 presents the most expensive conditions treated in U.S. hospitals among all payers in 2013. The 5 most expensive conditions accounted for 20.5 percent of aggregate hospital costs; the 20 most expensive conditions accounted for nearly half (47.7 percent) of aggregate hospital costs. Septicemia was the most expensive condition treated, accounting for $23.7 billion, or 6.2 percent of the aggregate costs for all hospitalizations. Other high-cost hospitalizations were for osteoarthritis ($16.5 billion, or 4.3 percent), liveborn (newborn) infants ($13.3 billion, or 3.5 percent), complication of device, implant or graft ($12.4 billion, or 3.3 percent), and acute myocardial infarction ($12.1 billion, or 3.2 percent). Hospital stays with principal diagnoses of complications of device, implant or graft and complications of surgical procedures or medical care accounted for 5 percent of aggregate hospital costs. The 20 most expensive conditions accounted for 43.7 percent of all hospital stays. Liveborn infants accounted for 10.6 percent of all hospital stays. Septicemia was the second most common reason for hospitalization, accounting for 3.6 percent of stays, followed by osteoarthritis (2.9 percent), pneumonia (2.7 percent), congestive heart failure (2.5 percent), and mood disorders (2.3 percent). Tables 2 through 5 list the 20 most expensive conditions for stays covered by Medicare, Medicaid, and private insurance and for uninsured stays in 2013. Seven conditions were among the 20 most expensive conditions for all four payer groups. There were some commonalities across payers in the conditions that generated high aggregate hospital costs. For all four payer groups, septicemia ranked among the four most expensive conditions. Diabetes with complications was top ranked for hospitalizations covered by Medicare and Medicaid and those that were uninsured. Coronary atherosclerosis and cardiac dysrhythmias were top ranked for stays covered by Medicare and private insurance and for uninsured stays. Mood disorders, liveborn infants, and biliary tract disease were top ranked for stays covered by Medicaid and private insurance and for uninsured stays. Among the most expensive conditions during hospital stays for multiple payers were osteoarthritis and back problems for Medicare and private insurance, pregnancy and childbirth for Medicaid and private insurance, and skin infections for Medicaid and uninsured. Given payer differences in demographic mix and service coverage, certain conditions were more common for some payer groups than for others. Osteoarthritis and back problems were top ranked among hospital stays covered by Medicare and private insurance. Hospitalizations associated with pregnancy and childbirth accounted for 5 of the 20 most expensive conditions for hospital stays covered by Medicaid and 3 of the 20 most expensive conditions for hospital stays covered by private insurance. Skin infections were top ranked for hospital stays covered by Medicaid and for uninsured stays. Seven of the 20 most expensive conditions for hospital stays billed to Medicare did not appear in the top 20 for other payers. Cardiovascular and respiratory diseases, orthopedic conditions, and conditions involving medical complications were among the 20 most expensive conditions for Medicare-covered stays. Schizophrenia was the only condition not related to pregnancy and childbirth that appeared in the top 20 for Medicaid but not for any of the other three payers. Hospital stays billed to Medicaid with a principal diagnosis of schizophrenia and other psychotic disorders accounted for over $1.2 billion in aggregate hospital costs in 2013. Another mental health condition—mood disorders—ranked third for Medicaid-covered patients. Cardiovascular and respiratory diseases, conditions involving medical complications, and neonatal complications were among the 20 most expensive conditions for Medicaid-covered stays. Conditions seen in the 20 most expensive stays for private insurance but not for any of the other three payers included maintenance chemotherapy and secondary malignancies. Hospital stays billed to private insurance for secondary malignancies accounted for nearly $1.2 billion in aggregate hospital costs, and maintenance chemotherapy stays accounted for over $1.1 billion in aggregate hospital costs in 2013. Osteoarthritis, live births, back problems, and cardiovascular and respiratory diseases were among the 20 most expensive conditions for privately insured stays. Osteoarthritis, live births, and back problems were the three most expensive conditions for which privately insured individuals were hospitalized. Injury accounted for 3 of the 20 most expensive conditions for uninsured individuals but only 1 of the 20 most expensive conditions billed to Medicaid or private insurance. Three of the 20 most expensive conditions for uninsured stays did not appear in the top 20 for any other payer. CCS categorizes ICD-9-CM diagnosis codes into a manageable number of clinically meaningful categories.7 This clinical grouper makes it easier to quickly understand patterns of diagnoses. CCS categories identified as Other typically are not reported; these categories include miscellaneous, otherwise unclassifiable diagnoses. Total hospital charges were converted to costs using HCUP Cost-to-Charge Ratios based on hospital accounting reports from the Centers for Medicare & Medicaid Services (CMS).8 Costs reflect the actual expenses incurred in the production of hospital services, such as wages, supplies, and utility costs; charges represent the amount a hospital billed for the case. For each hospital, a hospital-wide cost-to-charge ratio is used. Hospital charges reflect the amount the hospital billed for the entire hospital stay and do not include professional (physician) fees. For the purposes of this Statistical Brief, aggregate costs are reported to the nearest million. Torio C (AHRQ), Moore B (Truven Health Analytics). National Inpatient Hospital Costs: The Most Expensive Conditions by Payer, 2013. HCUP Statistical Brief #204. May 2016. Agency for Healthcare Research and Quality, Rockville, MD. http://www.hcup-us.ahrq.gov/reports/statbriefs/sb204-Most-Expensive-Hospital-Conditions.pdf. 1 Centers for Medicare & Medicaid Services. Table 01 National Health Expenditures; Aggregate and per Capita Amounts, Annual Percent Change and Percent Distribution: Selected Calendar Years 1960-2014. https://www.cms.gov/Research-Statistics-Data-and-Systems/Statistics-Trends-and-Reports/NationalHealthExpendData/Downloads/Tables.zip. Accessed March 9, 2016. 2 Martin AB, Hartman M, Benson J, Caitlin A. National health spending in 2014: faster growth driven by coverage expansion and prescription drug spending. Health Affairs. Epub ahead of print 2015; doi: 10.1377/hlthaff.2015.1194. 4 Carper K, Stagnitti MN. National Health Care Expenses in the U.S. Civilian Noninstitutionalized Population, 2012. Statistical Brief #457. November 2014. Agency for Healthcare Research and Quality, Rockville, MD. http://meps.ahrq.gov/mepsweb/data_files/publications/st457/stat457.shtml. Accessed February 24, 2016. 5 Estimates of costs in this Statistical Brief differ from the health care expenses collected in the Medical Expenditure Panel Survey (MEPS) cosponsored by the Agency for Healthcare Research and Quality and the National Center for Health Statistics. The Healthcare Cost and Utilization Project (HCUP) is based on billed charges, which are converted to estimates of the costs of producing hospital services using hospital-wide cost-to-charge ratios, whereas MEPS expenses represent payments to hospitals, physicians, and other health care providers and include amounts paid by individuals, private insurance, Medicare, Medicaid, and other payment sources. For more details, see Costs and charges in the Definitions section. 6 Agency for Healthcare Research and Quality. HCUPnet Web site. http://hcupnet.ahrq.gov/. Accessed March 7, 2016. 8 Agency for Healthcare Research and Quality. HCUP Cost-to-Charge Ratio (CCR) Files. Healthcare Cost and Utilization Project (HCUP). 2001â€“2013. Rockville, MD: Agency for Healthcare Research and Quality. Updated November 2015. http://www.hcup-us.ahrq.gov/db/state/costtocharge.jsp. Accessed February 17, 2016. 9 For additional information about the NHEA, see Centers for Medicare & Medicaid Services (CMS). National Health Expenditure Data. CMS Web site May 2014. http://www.cms.gov/Research-Statistics-Data-and-Systems/Statistics-Trends-and-Reports/NationalHealthExpendData/index.html?redirect=/NationalHealthExpendData/. Accessed February 17, 2016. 10 American Hospital Association. TrendWatch Chartbook, 2014. Table 4.2. Distribution of Inpatient vs. Outpatient Revenues, 1992â€“2012. http://www.aha.org/research/reports/tw/chartbook/2014/table4-2.pdf. Accessed February 17, 2016. Internet Citation: Statistical Brief #204. Healthcare Cost and Utilization Project (HCUP). April 2016. Agency for Healthcare Research and Quality, Rockville, MD. www.hcup-us.ahrq.gov/reports/statbriefs/sb204-Most-Expensive-Hospital-Conditions.jsp?utm_source=AHRQ&amputm_medium=AHRQSTAT&amputm_content=Content&amputm_term=HCUP&amputm_campaign=AHRQ_SB_204_2016.